Kaal, the Time Incarnate marches nonchalantly chronicling mundane events unwinding synchronously with the pulsations of the celestial bodies or planets in perpetual motion. Savants like Dr. B.V. Raman and others have marshaled sufficient observational data towards establishing the correspondence between the terrestrial affairs and planetary movements. 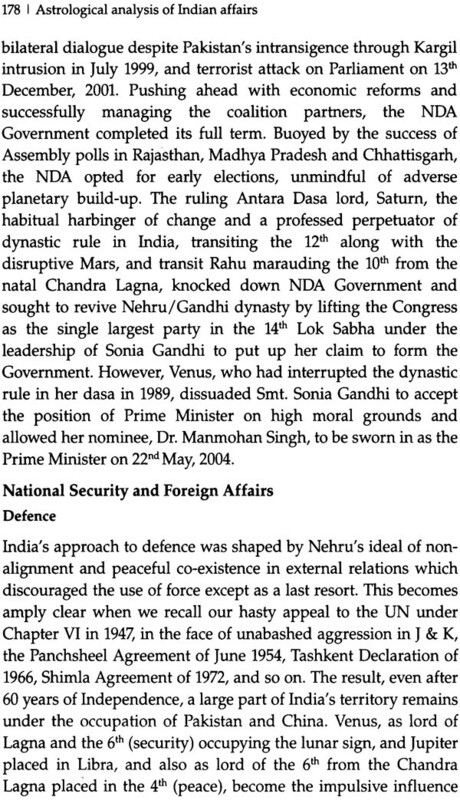 We have attempted here to examine how the general affairs in post-independent India have been influenced and shaped by planetary forces. 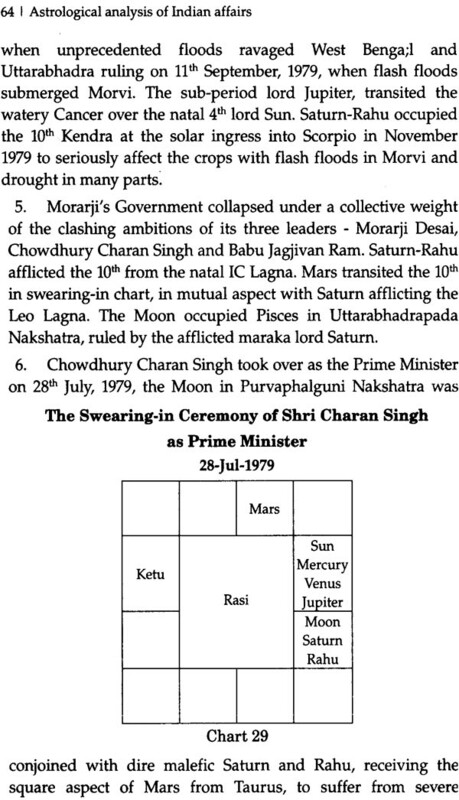 The Chart cast for the time of India attaining freedom on the midnight of 15th August, 1947 is the primary source, clearly explaining the chain of significant events concurrent with the planetary directions and transits. 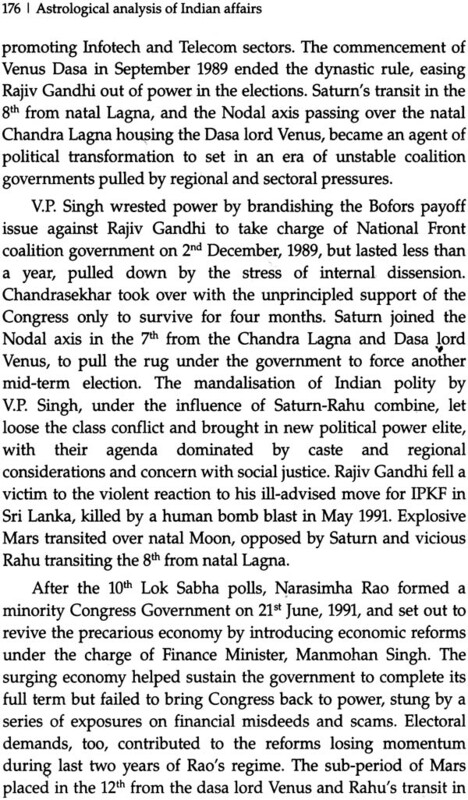 The planetary dispositions in India's Horoscope are a positive influence on the political, social economic, and cultural milieu that is evolving I the post-Independent Indian society, torn apart by sectarian, parochial, regional, and casteist group interests to release forces of disintegration and instability. 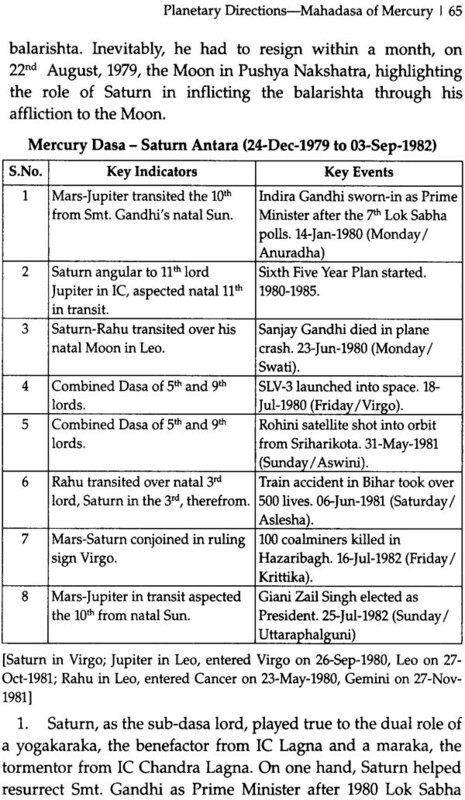 Key events have been presented chronologically along with the key planetary indicators of these events grouped under the Vimshottari Dasa-Antara Dasa segments. Each event has been analysed in the context of prevailing Dasa periods, the transits and wherever possible, I terms of the Chart cast for the time of the event. The analysis of the Indian affairs has also been presented sectorwise-polity, economy, industry, agriculture, science & technology, natural as well as national disasters, etc  to take a holistic view of the astral influence. 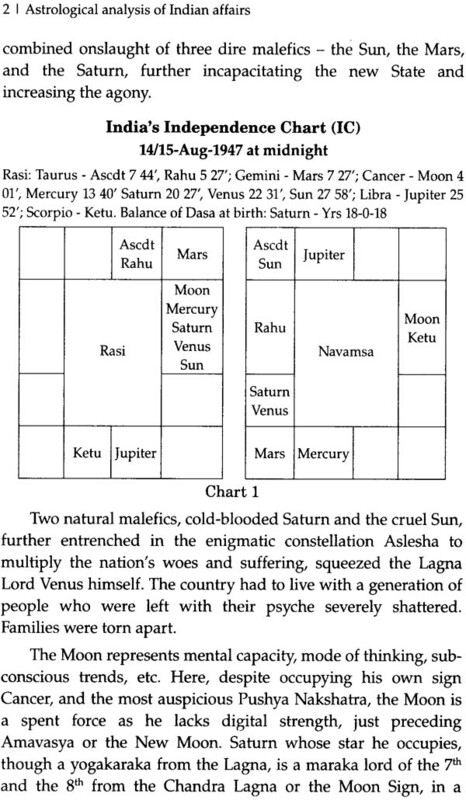 Lastly, the defining role of gochara or transits of major planets Saturn, Rahu, Jupiter and Mars in triggering significant events has been traced chronologically. In mundane astrology, the planets in transit appear to have a more overriding effect, acting as catalyst, instigator, trigger, either with respect to the sensitive points in the natal Chart or with respect to mutual dispositions. 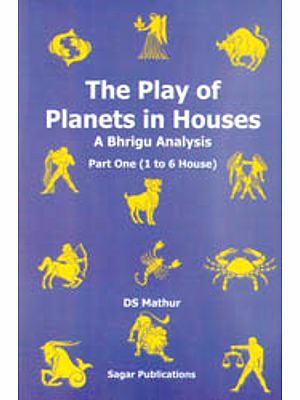 We trust, this factual analysis of the planetary influence on the Indian scenario will provide a dynamic, reliable astral key to interpreting the future trends of mundane affairs and help the national leaders in taking steps to overcome the adverse indications to the extent humanly possible. This book attempts to trace the history of post-Independent India astrologically. It presents the key events chronologically along with the important indicators of these events grouped under the Vimshottari Dasa  Antara Dasa segments. Each event has been analysed in the context of prevailing Dasa periods, the transits and, wherever possible, in terms of the Chart cast for the time of the event. The analysis of Indian affairs is made sectorwise- polity, economy, industry, agriculture, science and technology, natural and national disasters  to take a holistic view of the the astral influence. 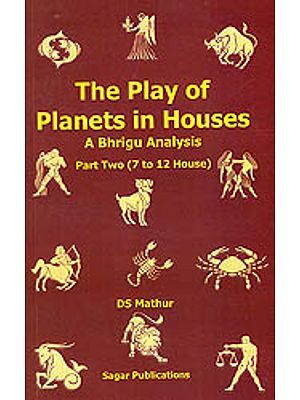 Also, it examines the defining role of gochara or transits of major planets such as Saturn, Rahu, Jupiter and Mars in triggering significant events. Finally, an attempt is made to work out the future trends of mundane affairs in the India's march ahead, covering the period up to 2050. 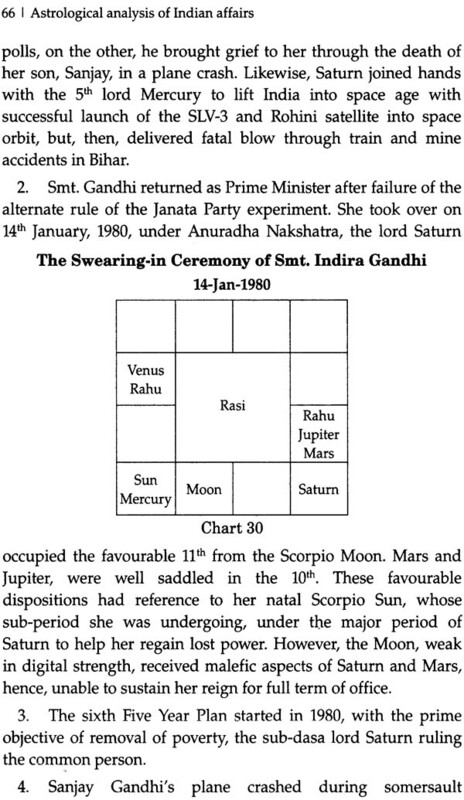 Dhruva (1936), a well-known astrological scientist, has a flair for tracing political happenings astrologically. He has been writing a monthly column "The World This Months' in the Astrological Magazine since 1992, giving the outlook and general trend in World affairs. 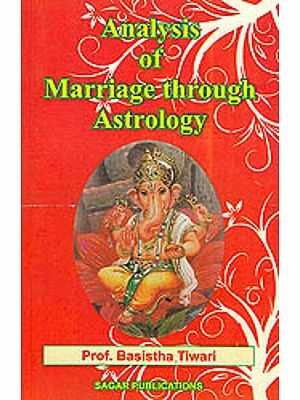 Dhruva has done considerable work in mundane astrology, especially in the area of prediction of natural calamities. 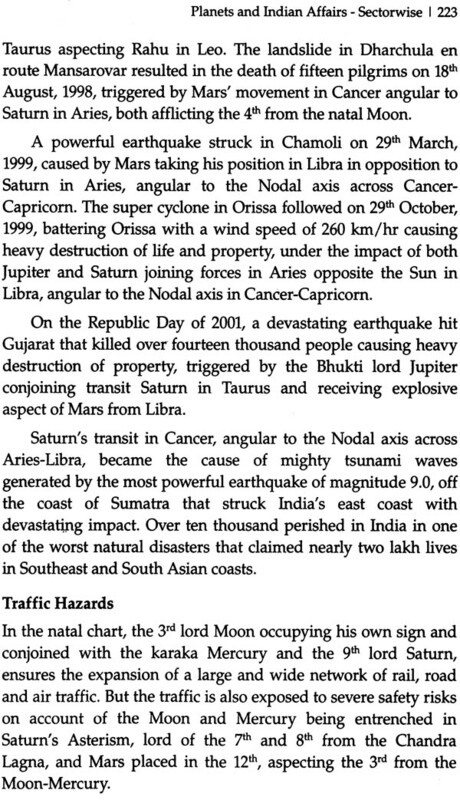 He has expertise in this branch of astrology that most of his predictions have come true, to name a few: the 9/11 terrorist attacks in New York and Washington, the unprecedented weather turbulence in Mumbai in July 2005, in United States in August-September 2005, and the deadliest plane crash of Brazil in July 2007. 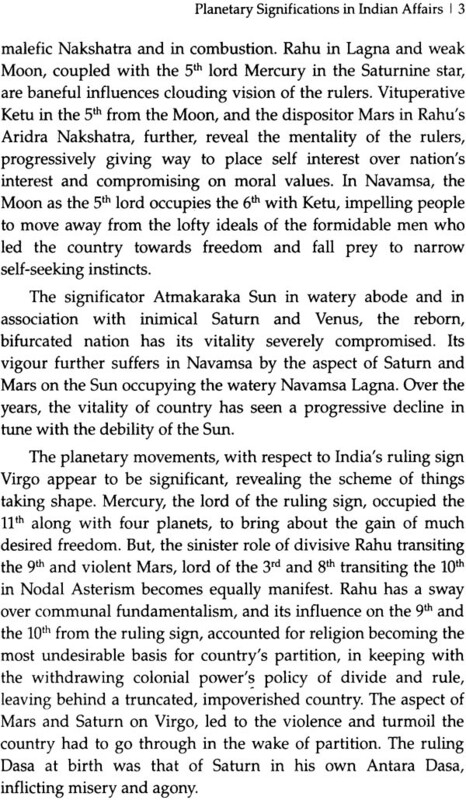 Astrology is India's unique gift to humanity. As a Vedanga, astrology or Jyotisha has its roots in Vedic times and an antiquity far anterior to the Vedic period. Broadly speaking, Jyotisha has three limbs. The first is Siddhanta, which comprises of Ganita or mathematics and Gola or spherical astronomy. This branch of. Jyotisha deals with the calculation of planetary positions and astronomical phenomena, like, the rising and setting of planets, eclipses and major aspects, and configurations now going under the name of astronomy. 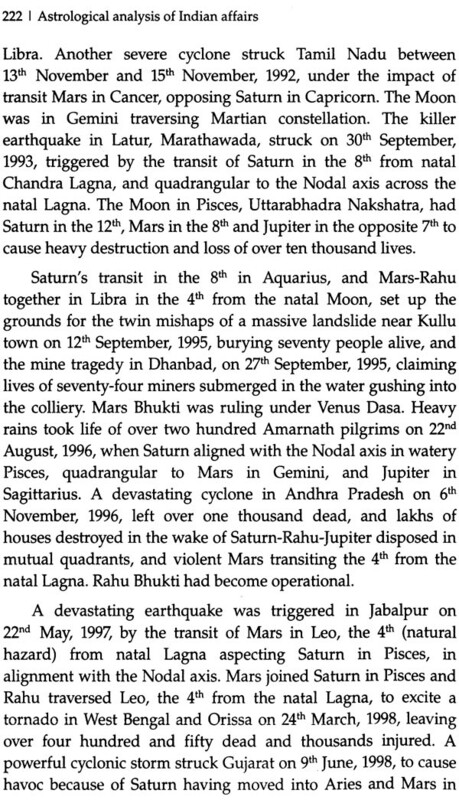 Samhita, the second branch of Jyotisha, deals with astronomical phenomenon and its impact on terrestrial affairs and natural events. The last is Hora or predictive astrology, which is the study of planetary movements and their influence on individual human lives. The last, named Hora, section of Jyotisha is the most commonly known part of this science. It has become an integral part of Indian society and the lives of its members. 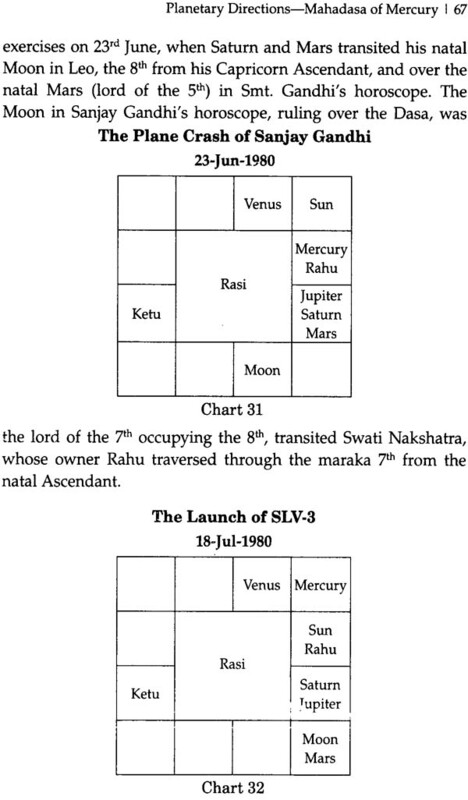 The second section of Samhita has, in a sense, not received the importance it rightly deserves and was in a state of neglect until the arrival of the Father of Modern Astrology, Dr. B.v. Raman, on the scene and his vigorous intellectual campaign to procure for Jyotisha its rightful place in the comity of sciences. 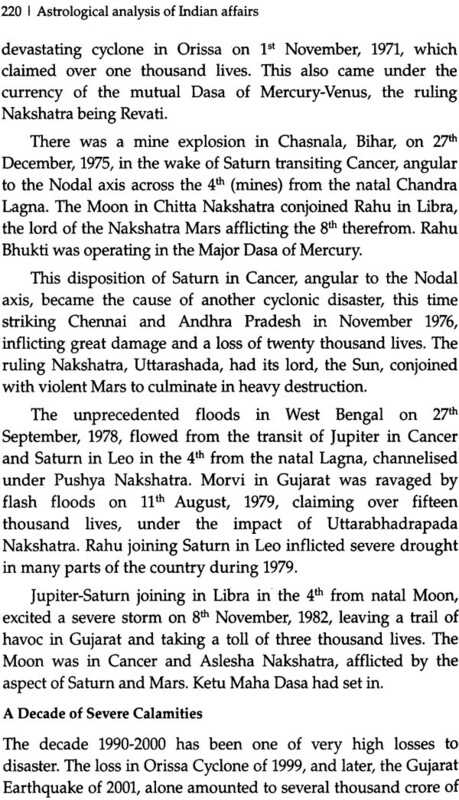 In what may be described as Dr. Raman's unique contribution to the world of astrology, several principles of Samhita or mundane astrology were ferreted out by him and illustrated in his remarkably accurate astrological anticipations of political developments and natural disasters around the world in the editorials he wrote in THE ASTROLOGICAL MAGAZINE for over six decades. Thereafter, this branch of Jyotisha began to get revived. 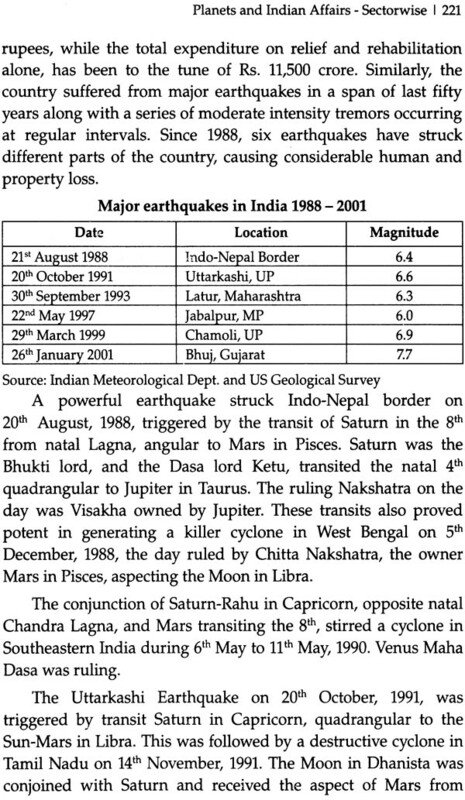 In this context, it is gratifying to note Dhruva has done considerable work in mundane astrology, especially in the area of prediction of natural calamities. 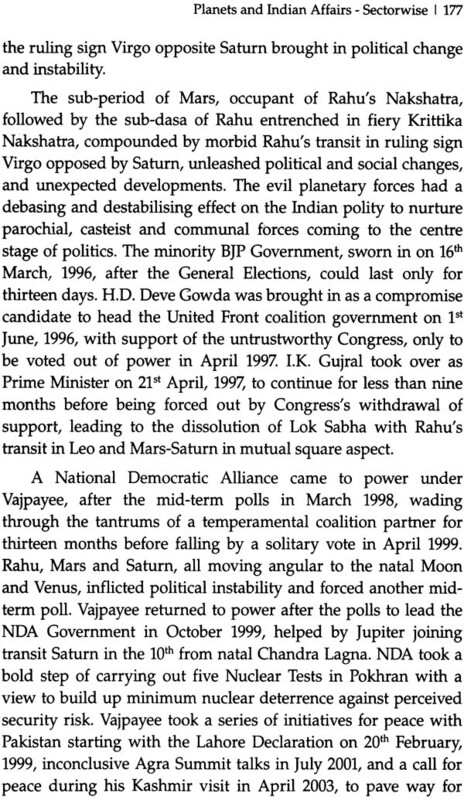 Dhruva, in his monthly feature in THE ASTROLOGICAL MAGAZINE on world affairs, has repeatedly displayed an excellent flair for tracing political happenings astrologically. It would not be wrong to say that he seems to have specialised in political predictions, especially based on analysis of New Moon charts, the method which is traditionally treated as highly dependable in prognosticating national and international developments much before their occurrence. He has, in his monthly feature, hit the 'bull's eye' in anticipating world events and natural disasters around the world. The present volume is the outcome of Dhruva's perseverance and diligence in understanding and tracing the history of post-independent India astrologically. The innovative approach employed in this volume is bound to interest not only the laity but also prove invaluable to those academically interested in astrology. 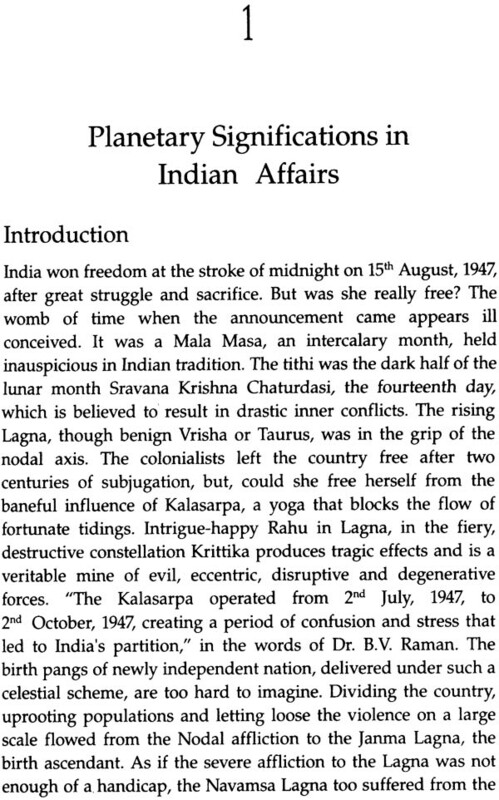 The chronological analysis of the major happenings in the country's history using the Vimshottary Dasa system in these pages is ample proof of the potential this technique has in deciphering events. It also testifies the expertise Dhruva has developed in this technique. The sectorwise investigation into astrological factors that the author employs in this volume is bound to stimulate interest in new ways of exploring different sectors of national and public life. Natural disasters, major ones that have hit the country, also, receive attention. This area of astrology holds immense scope in alleviating human misery and destruction. The author's efforts in linking planetary factors to such events, drawing inspiration from Dr. Raman's pioneering work in this area, merits serious attention by the scientific community. 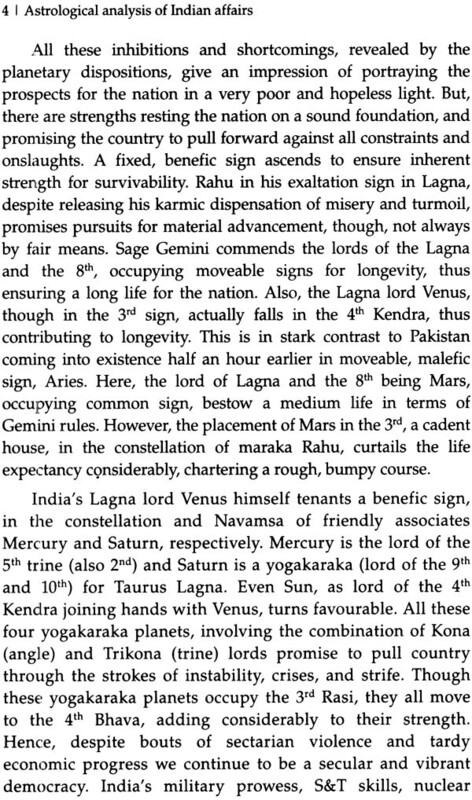 The defining role of the transits on the major planets, Rahu, Mars, Saturn and Jupiter, in mundane astrology, is well explained. 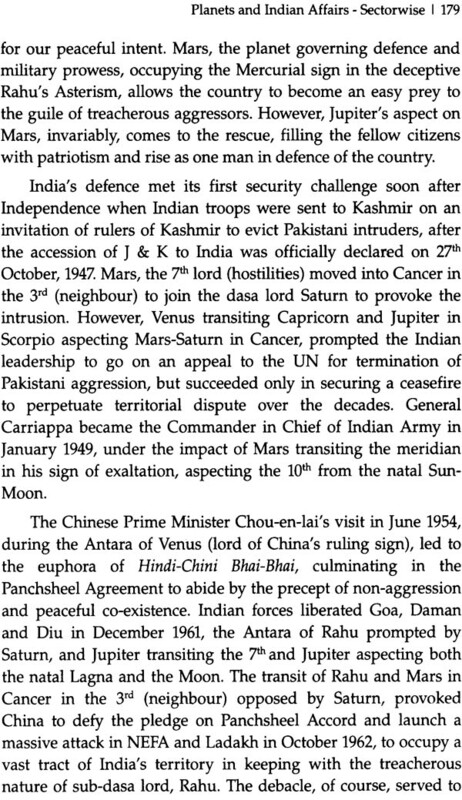 I am sure the author's efforts in rewriting the post-independent history of our country from the astrological angle will receive the recognition it rightly deserves. 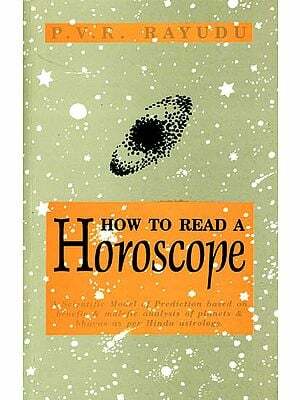 This volume can be of great utility to the student community, too, to understand the nuances of mundane astrology. Dhruva, who is a pseudonym, is keen that the "focus of readers will remain on the astrological analysis and interpretation of mundane events under an impersonal authorship, which may otherwise tend to degress into some bias if it appears under personal authorship; and may draw unwarranted criticism." The reader is bound to be curious about the author's identity but with due deference to, not necessarily endorsement of, Dhruva's wish, it has not been divulged in this volume. This spirit of self-effacement speaks volumes of the author's sincerity to present mundane astrology in its pristine essence to the modern mind. I wish Dhruva greater success in his endeavours in mundane astrology.